Omegle is a great service to make new friends from all around the world. The website offers interesting services like text, video, spy mode and college student chat. Unfortunately, we can't use video chat feature in mobile, but we can use smoothly rest others. You can access website just typing url in mobile browser. You can use chat through omegle app which can be downloaded from app store. 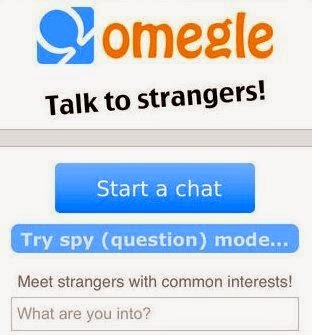 Type www.omegle.com in your mobile browser address bar and continue. At the top of the home page, blue "start a chat" button will appear. Click that button to start chat with random strangers. To connect with another stranger click stop, really and new button. Another function that can can be use in mobile is spy mode. Just enter your question on box and click the "ask strangers". Now you can watch strangers discussion on your question. It is another cool function that can be accessed through our mobile. By this feature, you can meet with strangers having similar interest. Student student chat newly started feature which let you chat with strangers from same universities or colleges. If you are iphone or Ipad user, there is an app in itune store which can downloaded by just paying .99$. So, I have mentioned all features that can be accessed through our mobile phones. Hope, you have liked the article.